Many parts of Grasslands National Park in Saskatchewan, Canada are barren and dry, but the area in the West Block is where water is found along the Frenchman River Valley. 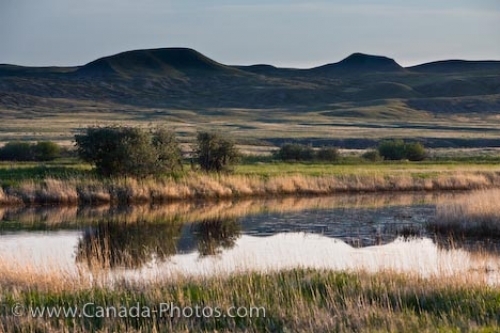 The landscape in Grasslands National Park in Saskatchewan, Canada is miles of rolling hills, ravines and coulees where wildlife roams in the Frenchman River Valley in search of water. Approximately 10,000 years ago when the retreat of the last glacier took place, the ice melted, and created two separate divisions in the Frenchman River Valley. The north side was higher than the south and the melting water flowed southward until it met up with the ice and a stream of ice water was created which now makes up the French River Valley. The glacier melt altered the landscape considerably and formed the coulees, buttes, creeks and landscape which visitors see today. Landscape of the Frenchman River Valley in the West Block of Grasslands National Park, Saskatchewan, Canada. Picture of the river in the Frenchman River Valley in Saskatchewan, Canada where wildlife feeds and plants flourish.